We kept a boy and a girl and extremely pleased with every aspect of the two. They are healthy, beautiful, and their personalities shine. They are affectionate, playful, interactive and quite bold. 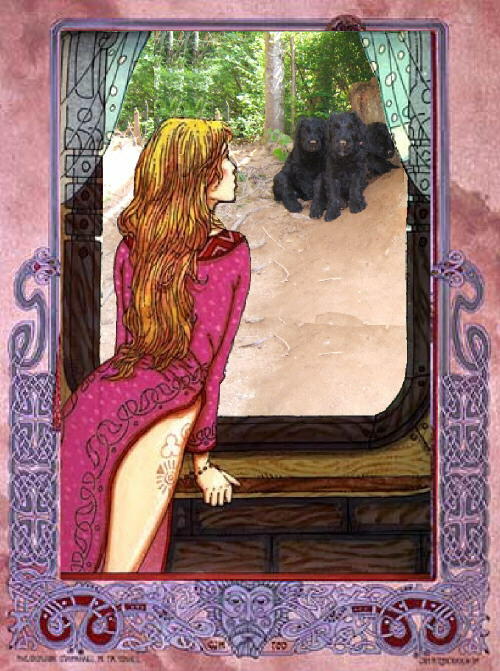 Anna is a bit more of a socialite than Azik, who is more wary of strangers. Both have excellent guarding instincts and are not afraid of anyone. You can visit Anna and Azik in the Gallery section. 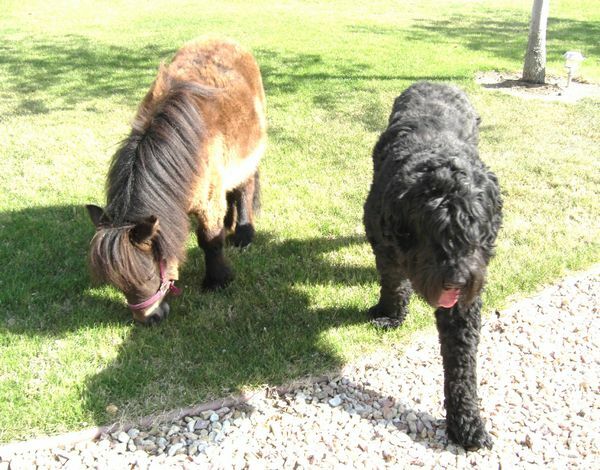 Maylish - All grown up and hanging out with miniature horse & goats - Murrieta, California.
" She is everything you said she would be, and we are both adjusting really good. You all did a fantastic job with nurturing these puppies. They are so strong and healthy.. and smart too." "She can be very affectionate, quite bold, and demanding (you should of seen her telling us that she deserved the pizza we had Mon night!). She is very sweet and as you can tell we are quite happy with her." "Buka is great!! Last night we took him to my softball games and everyone came up to inquire about him. No-one believes he is only 10 weeks old. He knows how to sit and stay, and we are working on the taking the treats nicely. He is pretty amazing for only being a pup." 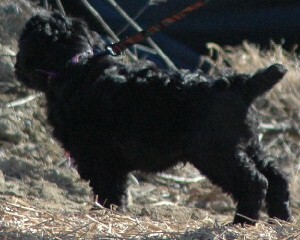 "Apollo is a joy and so much more........"
"She has a wonderful temperament and I love her to death. Just wanted you to know that everything is going beautifully. Thanks for letting me have this darling puppy." ". . . this is the best puppy he has ever seen, and he grew up with various kinds of dogs all his life." "He is also really good with the little kids. Everyone says how cute he is, but people can't get over how well behaved and how well he minds for only being a puppy." "Thanks for keeping up to date on your photo site. It is nice to see the other dogs. You are good breeders. So many people ask me where I got him. If I had a nickel for every time, he would soon be paid for!" "Dasha is doing great she got her Canine Good Citizen certificate right at six months, she has passed her obedience class with flying colors and got her certificate, she has taken a canine tricks class and can high five, bow, spin, and be placed under arrest (her favorite) she puts her paws on the wall or counter and lets you frisk her for weapons then you tell let’s go to jail and she follows you where ever you go. When continue to take her out to socialize at least four days a week and get stopped all the time by people wanting to know about her and her breed. We take her to Lowes, Home Depot, Out Door Mall, Strip mall shopping Center, Humane Society, outside grocery store, Petco, the vets in our area, the park, we walk when the kids are coming home from school so she see the kids and hears the yelling, Pam works at our dog training place one day a week part time and she goes to work with her. We always tell people she is the best dog we have ever had but is not for everyone. We always tell them if you don’t’ want a dog in the house, can’t spend an hour and half for the exercise and obedience training daily and another hour or two a at least 3 days a week to socialize this not the breed for you. 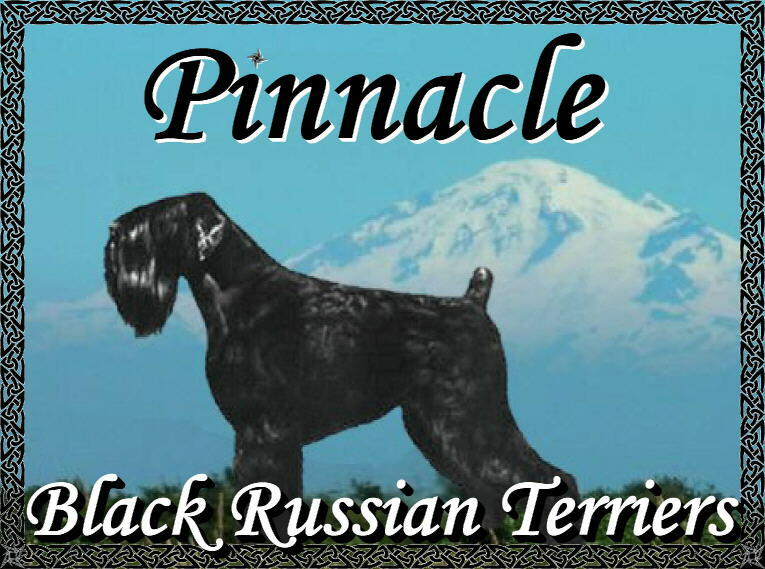 Our Black Russian Terriers come from world champion lines, Russian champions and Israeli champions lines. Please check out the dams and sires pedigrees for yourself. Our pups have good conformation and good temperaments. Obviously, there may be a pup or two that are truly exceptional in the litter that are champion calibur. We will reserve him/her for someone interested in showing, breeding or just want the very best. We care very much for our BRTs and what type of homes our puppies go to. For this reason, we need to know more about you and your household to determine the suitability of the pup to your family. Before sale, we require a puppy application to be either filled out and returned to us via EMail or you can call us to answer the basic questions. We are more than happy to answer any questions you may have about our BRTs or about BRTs in general. The first 8 weeks of a puppy's life are critical for their lifetime personality. 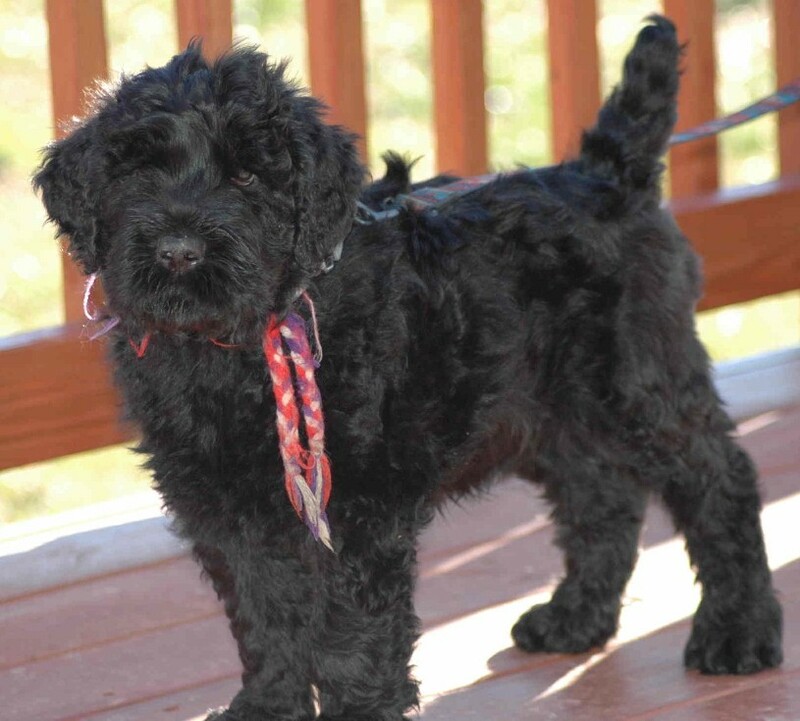 Our puppies are lovingly born and house-raised in clean, comfortable surroundings. Careful attention is given to their socialization and development. The extra time spent with the puppies makes a big difference in their personalities. Our puppies are not the least bit shy. They are bold, affectionate and fearless. At time of sale, all puppies have been vaccinated and wormed as appropriate for their age, micro-chipped and have had their dewclaws removed. Naturally, all of our puppies are registered with the American Kennel Club. 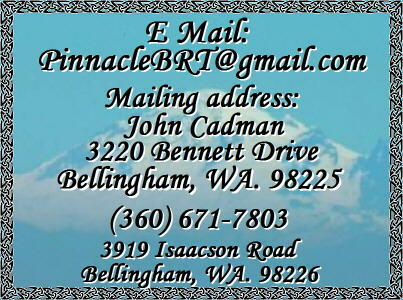 We offer one of the very best breeder-support systems in the Northwest. We are always available to answer questions on care and training. If we can't answer the question, we can refer to someone who can. We care very much about the puppies we produce, and have specific requirements for our potential homes. 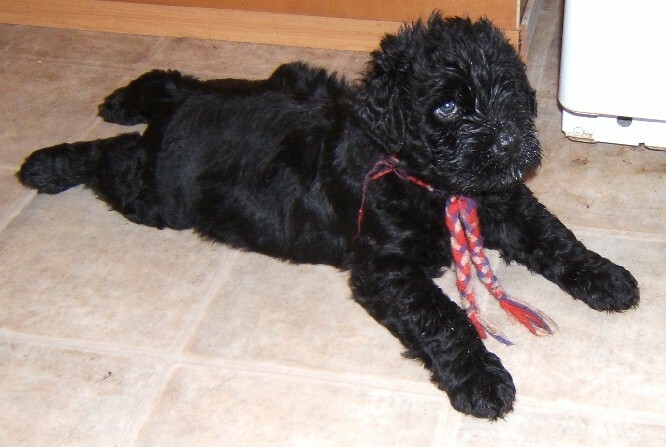 We reserve the right to refuse the sale of a puppy to any home we feel is not suitable. 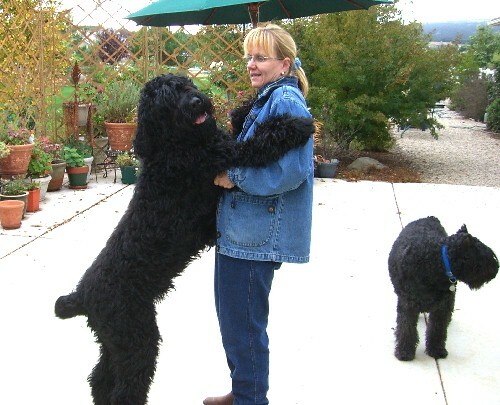 A Black Russian Terrier purchased from us must be maintained as a housepet and the owner must have a securely fenced yard. We do not sell Black Russian Terriers to homes that allow them to free-roam or use chaining as a method of containment. If necessary, a home visit is required prior to sale. If necessary, a club associate may make the home visit. Attendance at a Puppy Kindergarten class is required. All pet puppies are sold on a spay/neuter agreement. A puppy sold as "show" can be shown. In the event the purchaser cannot keep a dog, the BRT may be returned to us. We are located in Bellingham, Washington. Bellingham is 100 miles north of Seattle, or 30 miles south of Vancouver, B. C.
Quality pet, male or female - Not the pick of the litter, but the pups right behind it. In other words, if you would like to show this pup he will be good enough quality and, except for a judge trained in seeing structural faults, no one can differentiate these pups from the champions. We do sell our pet females with a spay contract, or if you prefer not to spay, we do sell our pet pups under AKC's Restricted Breeding Registration. Both will be lifted if you finish the championship on the female. Just send us a copy of the AKC championship certificate. The pick of the litter - or the pups we feel are extra special and are reserved for people who want to show, breed, or those who want the very best. We feel very strongly that only the very best should be bred and we are very strict in our grading. We may grade only one or two in any litter as top show, sometimes there are none. Call or write for current pricing. We do require a 10% non-refundable deposit to hold a pup. We guarantee every one of our dogs in writing and stand behind their quality. All our pups are bred for good looks and disposition. To be fair, payment is expected upon delivery. All dogs shipped to other states are shipped from Seattle. We can ship the pup to you any day of the week. Some airlines do not accept dogs on weekends. You may pay with a check or money order sent to the kennel. For puppies sent by air, payment is expected prior to delivery. Please call or write if you would like more information. If for any reason you do not like your pup, please return ASAP (within 30 days). A refund will be paid except for shipping. There are strict weather controls-so if the temperature in your area is 85 degrees plus or 30 degrees and below no airline will accept a live animal. Prices fluctuate from city to city and from airline to airline. In some cases dogs cost more than what a passenger would pay for the same trip. To make it fair for everyone - each puppy buyer will pay for his pup plus exactly what it will cost to ship the pup to his city. The airline charges shipping by volume so we try to use the smallest possible kennel to save on shipping. All pups will be checked by our veterinarian before being shipped - he has the final say. We cover his cost which includes the health document required by the airline plus all first vaccinations and microchipping. We include all costs except air freight in the price. There are no additional costs. Finally, there is the cost of shipping itself which truly varies depending on which airline, where the pup is going and the size of the crate. We will bill you the exact price a few days before shipping but if you’d like to find out for yourself just call the airline you know flies to your area - tell them you’d like to know the exact shipping cost from Sea-Tac International airport to your city and if you tell them the size of the crate they will give you the price. We have been shipping via Alaska Airlines, American Airfreight and NorthWest Airfreight. The average cost of delivery minus the crate is about $200. Puppies outbound to Detroit via Northwest airfreight. At long last, the day you have all been waiting for, your new puppy will make its grand entrance into your home. Before you bring your companion to its new residence, however, you must plan carefully for its arrival. Keep in mind the puppy will need time to adjust to life with a different owner. First impressions are important, especially from the puppy's point of view, and these may very well set the pattern of his future relationship with you. You must be consistent in the way you handle your pet so that he learns what is expected of him. He must come to trust and respect you as his keeper and master. Provide him with proper care and attention, and you will be rewarded with a loyal companion for many years. Considering the needs of your puppy and planning ahead will surely make the change from his former home to his new one easier. When your puppy moves in, the first days are a lot of stress for him. Plan to bring your new pet home in the morning so that by nightfall he will have had some time to become acquainted with you and his new environment. Avoid introducing the pup to the family around holiday time, since all of the extra excitement will only add to the confusion and frighten him. Let the puppy enter your home on day when the routine is normal. Avoid everything in the first time what scares the pup. He even may refuse to eat. So food must be more nutritious and palatable at first time. You should have obtained some of the same food puppy was eating at its first home. Shifting foods now can be a serious mistake and should not be undertaken without legitimate reasons. Dietary changes may bring on bowel upsets and even an increase in stress level for the puppy. Diarrhea may come about because of the stress of the move. If it continues for more than a day, contact your veterinarian. Don't invite too many people, your puppy has to learn first who is member of "his pack". And, if there are other dogs or animals around the house, make certain all are properly introduced. If you observe fighting among the animals, or some other problem, you may have to separate all parties until they learn to accept one another. Remember that neglecting your other pets while showering the new puppy with extra attention will only cause animosity and jealousy. Make an effort to pay special attention to the other animals as well. As simple as it sounds, there are several important thing to know about the act of picking up a puppy. Puppies are often squirmy, active youngsters. Be sure to always support the puppy's rear end with one hand while comfortably cradling its chest with the other hand. This will make the puppy feel secure and keep it from jumping out of your hands. Don't try to hold more than one puppy at a time. If you want to compare them, have someone else hold one while you hold the other. Don't lift puppy by the scruff of the neck. Training for your new puppy begins immediately. It is good to have ready an outdoor area picked out as a urine and feces relief site. You may be able to "salt" this location with some droppings or litter from the puppy's first home. Immediately upon arriving home, take the puppy to this site and wait until it relieves itself. The smell of urine or droppings should encourage the puppy to do this. When it does, as it generally will, enthusiastically prize the puppy. Always use the same expression, i.e. "pipi". Soon he will learn - what you mean by that. Puppies at the age of 9 to 12 weeks have to do their business approx. every two hours, especially after sleeping and eating. Of course, the very young puppy has to go outside for his business also at nighttime. Should it happen, that the business was done in your house, don't punish the pup. If you catch him "just in time" when it is happening, say sharply "NO", bring him to the relief place and say friendly "pipi". He will know very soon that your room is definitely a wrong place. Don't forget prize the puppy every time he did right. You have to set up appropriate place for puppy. The greatest aid to allowing your dog to live comfortably under the same roof with you and your family is the cage, crate, or carrier. Utilizing the natural instinct the dog has to be a denning creature will not only be a better way to share living quarters, but it is also better for the dog. Place the create somewhere that is out of the way but not isolated. Pick a spot that will let the puppy see what is going on in the room when it is in the crate, but that doesn't sit right in the main walking area. When you first introduce your new puppy to your home, let it have a chance to get acquainted with its new family in its new surroundings. No roughhousing activity with the youngster now, only gentle play. When you play you should end up as the winner - but from time to time puppy also needs success. You decide when the playing time is over - not the puppy. Use the play to do easy training (like the mother in a wolf-pack). Careful - don't demand too much! The puppy needs a lot of rest. Watch the pup to see if it needs to make a trip back to the relief area. If it does show any sign of wanting to urinate or defecate, quickly and gently pick it up and head to the relief spot. If you make it in time and the pup uses the area, always prize it lavishly. This is the first step in housebreaking your puppy. Keep play times brief with the puppy in the initial days. As it begins to tire, gently move it to the home-scented crate. You want the pup to associate being tired with going to his place of rest. Simply place the little one in the crate, shut the door, and walk away. You puppy must learn that the crate is place for rest and sleep. This is not just important for the day, but for night as well. The puppy must recognize that when it is placed in the crate at night that it should go to sleep. Without any doubt the first nights will be somewhat problematic. On that eventful first night, try not to give in and let the puppy sleep with you; otherwise, this could become a difficult habit to break. Let him cry and whimper, even if it means a night of restlessness for the entire family. It is important to be gentle with the new puppy to help it get the best possible start in its new home. Don't be mad at him. Speak to a lonely, crated puppy sparingly, but with a calm and reassuring tone. This will let the pup know that you aren't far away. Socialization is essential for BRT puppy. Socializing a puppy literally means introducing it to new things and people in a nonthreatening manner. This socialization process makes the difference in whether an animal will be wild or tame and comfortable around humans or afraid of them. All the stories about dogs being born in the wild or wild wolves becoming like lapdogs after meeting just the right human are just stories. Animals begin to learn early as a part of basic survival. It is generally true that a dog that has not bonded with humans before it is 12 weeks old is not likely to ever do so. When the dog in question is one of the most powerful canine athletes on earth, the matter of socialization takes on even greater significance. BRT puppies are like little learning sponges soaking up information from their earliest sentient moments. Because dogs use their sense of smell even more than their sense of hearing and their hearing more than their sense of sight, the first human scents that comes their way will be registered while the pups are still blind sucklings. What they hear, in terms of tones rather than actual words, will become part of their inventory of threatening or nonthreatening stimuli. The right kind of socialization will introduce the puppies to different types of people: males, females, children, older people, and people from other ethnic groups than the breeder. In this way, the mental and acceptance horizons of a very young puppy are broadened to include many different humans. The puppy learns that humans, as a group, pose no threat. 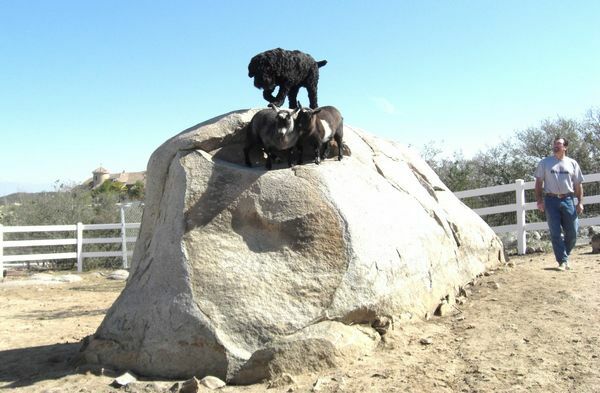 Some breeds become thoroughly socialized more easily than others, but most experts agree that the canine that becomes the best companion or pet is the one that receive the best socialization. Socialization can also take place between the puppy and other dogs, cats, and other animals that the dog may encounter in its life. Some of the herding or herd protection breeds are exposed to the smells and sounds of sheep very early in the pup's lives, which helps to forge a bond the dog will have its entire life. Without appropriate, gentle, thorough socialization, a dog will never reach its potential as a pet or companion. Unsocialized BRT could be among the worst dogs to own. Your puppy will not just automatically know the things you will want it to know any more than a human infant would be able to function without someone to guide and teach it. No one in the pup's new home should be harsh or severe on a pup during this time. The puppy needs to learn its first lessons in its new home in a warm, trusting, and supportive environment. Remember that your puppy wants nothing more than to please you, thus he is anxious to learn the behavior that is required of him. Prize and encouragement will elicit far better results than punishment or scolding. Consistency is vital here as in every area of pet ownership. BRTs are quite intelligent and remember much more than you think they will. If a little puppy is allowed on the couch, the same dog as an adult will expect to be allowed on the couch. It is not allowed as an adult to do what it did as a puppy, it will stubbornly remember this as something inconsistent. Dogs, like most children, are great limit tryers. They will want to see how far they can go this time with an activity that was not clearly stopped last time. A puppy must be gently, but firmly taught the behaviors that you will expect of it as an adult. A lot of potentially great dogs in many breeds have been almost ruined by inconsistent behavior from their humans. Don't do this to your BRT! Dogs are not able to think like humans. Very often dog owners do the mistake to punish their pet at the wrong time, that means a while after the situation occurred. Swallow down your anger. Only if you catch pup "just in time" you can punish him, because otherwise the dog will not associate what he has done with your punishment. If your dog ran away don't punish him when he comes back. He would associate the coming back with your punishment and run away from you when you call him. A sharp "NO" correctly said and not yelled is enough to keep puppy away from forbidden things. If you have to punish him, because he chewed the fifth time your phone wire and also ignores your "NO", grab him at the scruff of the neck and say sharply "NO". If he's staying away from the cable, prize him. In general you should always prize your dog if he's doing right. BRT is naturally more fixed to one person. Yet he should be able to tolerate of another people. The puppy should not react too friendly to "strangers" but also not very shy. Growls or bites the puppy (don't mix up with nibbling i.e. at your fingers) always, he should be punished in the described way. Put your puppy - if possible once a day - on the table and say "STAND STILL" to him, but secure the puppy in the beginning with your hands. First a few seconds will be enough. You can increase the time later. Brush carefully his back and touch different parts of body. Commend him always when he's doing right and also give him his preferred tidbit whilst on the table. Thus, visit a vet, trimming and grooming will never be a problem. Never yell at your puppy, he can hear much better than you and he heard your command already (at the first time). If you yell at him he wants to get all commands in the future yelled. Yelling is only for emergency situations! Never hit your puppy. He will loose the trust in you. Long before your pup is old enough to begin serious obedience work, he can be helped by a program of planned puppy training. You will accomplish much and risk nothing by studying the obedience book, and then teaching your pup, according to its instructions, all he can learn, omitting any corrections until he is six months old or until he tells you with a show of guilt that he knows he disobeyed. This policy will prevent any possibility of corrections being made too soon. During the first formative weeks of your relationship with your new puppy, keep the youngster close to you. The crate is an appropriate place to confine a puppy or dog when you can't supervise it, but it should never become a substitute for the vitally important human interaction the youngster needs. Your puppy will learn a lot by being with you and this will being the all-important training phase of the young dog's life. According to a report by the Merial Corporation (2001), dogs age more quickly in their early life than humans. Table 1, provides the age equivalents for dogs.